TABLE OF CONTENTS. VOLUME II. CHAPTER 2.I. 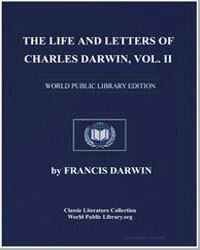 -- The Publication of the ’Origin of Species’ -- October 3, 1859, to December 31, 1859. CHAPTER 2.II. -- The ’Origin of Species’ (continued) 1860. CHAPTER 2.III. -- The Spread of Evolution -- 1861-1862. CHAPTER 2.IV. -- The Spread of Evolution. ’Variation of Animals and Plants’ -- 1863-1866. CHAPTER 2.V. -- The Publication of the ’Variation of Animals and Plants under Domestication’ -- January 1867-June 1868.